My experience tonight at Perla's was the complete opposite of what I had experienced when it's former occupant Mars was in that spot. And all I can say is thank god for that! Arriving at 5:30 pm for an early dinner in conjunction with Austin Restaurant Week, the light hits the interior of Perla's beautifully -- it's literally refreshing and airy (especially with few patrons in it at that hour). The bank of booth seats is done in bright yellow, and white and blue accents round out the color scheme; nautical, but not garishly so. Waiting by the oyster bar for a few minutes while the hostess changes out the menus, I can see a meeting of the waitstaff in the back of the restaurant. 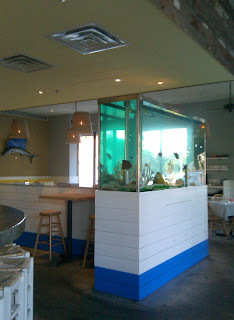 The bar has a few patrons, and a young woman shucks an oyster or two. What interested me though, is the man who came along with a spray bottle, labeled "vinegar & water", and he proceeded to spray the inside of the glass barrier, around the oysters. A non-chemical window cleaner in a food prep area! Brilliant! And he was wiping it up with over-sized coffee filters, which he said didn't leave lint like paper or bar towels (I asked). A nice touch. 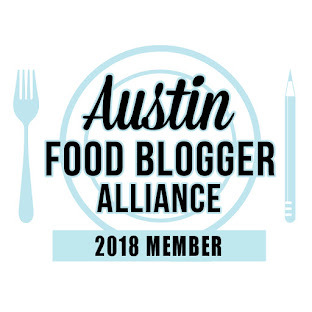 Austin Restaurant Week allows patrons to dine at certain places for fixed prices; 5 % of the week's proceeds will go to the Sustainable Food Center. I was there to specifically support ARW, and I could tell other patrons were too. I wanted to go someplace I had never been before, and while my fellow foodie has been to Perla's she was eager to return, raving about the grilled octopus she had eaten previously. We started with cocktails, for me, something I now believe was called the Meridian, a honey & thyme infused vodka with ice tea (currently not on their online menu, which appears not to have been updated since Feb. 20) and I think my companion had the Rye Maple Sour. Both tasty, indeed. Working off the abbreviated (but not limiting) ARW menu, I took the shrimp & roasted tomato bisque as my first course, and my companion the 4 freshwater oysters, shucker's choice. 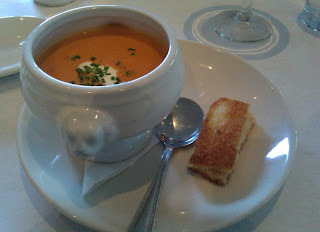 The bisque was nice, very smooth, maybe a hint of saffron and some nice fish stock gave it some richness; it was topped with a swirl of creme fraiche, and a dainty 2 bite grilled cheese (a little greasy) along with it. The oysters were inhaled in about 2 seconds! The very affable waiter recited the names of the 4 when he brought them to the table, but all I remember was Pickle Point from Prince Edward's Island was one of them; they do come with a trio of sauces: horseradish, cocktail, & mignonette (shallots & vinegar). 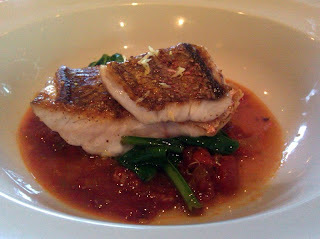 For the main course, I chose the Crispy Gulf Snapper with Lemon Spinach & Spicy Sofrito. And all I can say is fresh, fresh, fresh. The lemon really gave everything a nice brightness, from the fish, which was perfectly seared, to the slices of garlic in the sofrito. Don't think I'd call the sofrito spicy, but I think it was made from cherry tomatoes, because it had a nice sweetness to it. It was really delicious. My companion picked the grilled mullet from the Fresh & Simple Market Seafood; the waiter said it was delicious, and they had just gotten mullet in for like the very first time ever. It was a beautiful presentation, two whole smaller fish, bones and all! It was probably more work than I would have been up to in a restaurant to pick over it, but my companion did well. I still get a kick of seeing the whole skeletal system being lifted off one's dinner plate. 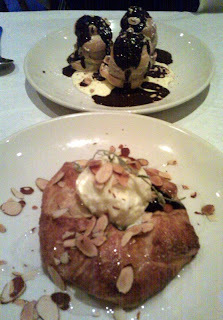 The dessert course had multiple options, and we settled on the profiteroles with coffee ice cream & chocolate sauce, and a blueberry crostata tart with toasted almonds & vanilla ice cream. Do they make their own ice cream? The coffee one was particularly good, and you could really, really taste the butter in the tart dough. And I am guessing these were fresh blueberries, not frozen. Not that I am complaining about butter (who ME? ), but I couldn't finish it! I had heard a few things about Perla's, most of it good, but now I can firmly say it was a great all-around experience. 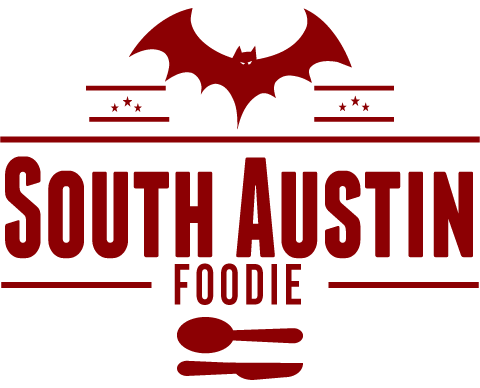 The service, food, & atmosphere was great, and I now look forward to (slightly) warmer weather and to be able to sit on their large SoCo patio with a cocktail. Also highly amusing was the choice of viewing on the TV at the bar. Finding Nemo. And as my friend said with a laugh "Now that's just tacky!" Nemo's cousins are quite tasty, I can attest. Wow! Great job, girl, and gives me a template for assessng your other restaurants. Enjoyed it immensely, especially seeing you and reconnecting with your lovely energy. You are a treasure.